Nov. 4, 2017 11:30 p.m.
Prime Minister Justin Trudeau placed poppies at Ottawa’s National Military Cemetery as he marked the 100th anniversary of the Battle of Passchendaele. Over 15,000 Canadians were killed or wounded at the battle in Belgium. 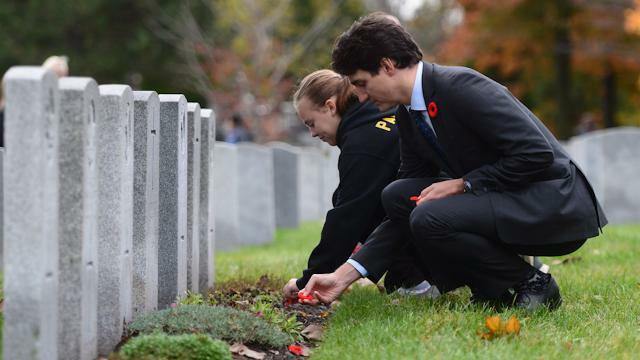 Under grey skies at the National Military Cemetery in Ottawa Friday, Trudeau told a small group of military members, veterans and school children that the sacrifices from that battle are proof of reckless leadership at the highest levels. But he also said it was a battle worth remembering because of the perseverance and commitment that Canadian soldiers demonstrated under near-impossible conditions.